888 could well be dubbed the Grandfather of online gambling seeing as it hit the web way back in 1997 – not long after the internet itself became widely available. The early bird catches the worm or so they say, and this is certainly the case for 888 who have grown to become a truly global casino, with a website available in 13 languages serving the 25 million members that have signed up so far. Having invested in their own proprietary software, Dragonfish, otherwise known as Random Logic, they can offer exclusive games that may well entice players who are tired of the same old slots. This doesn’t have to mean compromising in terms of choice though, as they also offer games from other tried and tested providers. 888 is also one of the few casino’s that still offer a download option alongside their instant play casino, although it’s virtually identical but for the benefit of a few extra games, and it is PC only – sorry Mac users. They also run a blog and ‘Eight Magazine’ which is testament to their ambition to be a real destination for gamers as opposed to just another casino site. Credit where credit is due, the site looks fantastic; they have got the visuals just right. It’s colourful and exciting without being shouty, and it feels like a website for the modern-day player. Everything works seamlessly as you transition from one page to another and it instantly feels like a place of opportunity. 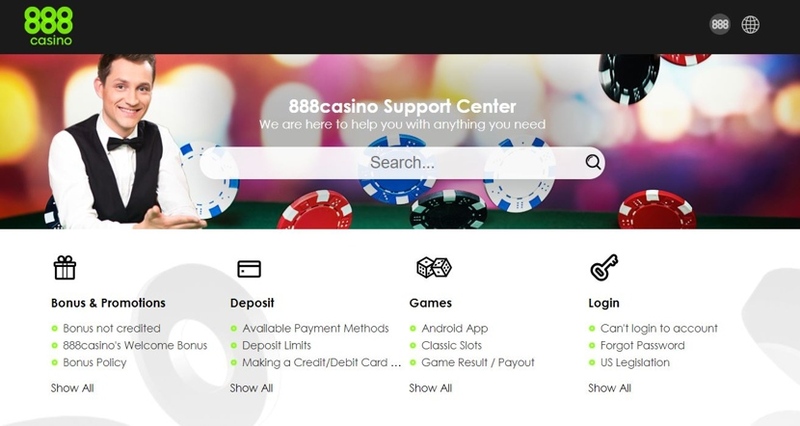 There are some great, innovative features on the 888 Casino website as well, so it seems odd that they have slightly neglected other areas, especially since it’s all run on their own Dragonfish platform. We love that if you roll over a slot icon, for example, you will be shown key details for that slot before you load it up, such as min/max bet, paylines, features and a brief description. There is also more detailed information available if you want it once you select the game, especially when it comes to the Live Casino games. However, when it comes to search options you are left to scroll until the end of time. You can select Jackpots, New, or 888 Exclusives, and there is a search bar if you know what you are after, but as far as browsing is concerned you won’t get much assistance. In terms of quality and choice the catalogue is handpicked with precision; so, if you are a newcomer to online gaming a lot of the leg work has been done for you. Any game you choose at 888 will be of the highest quality, you won’t have to wade through a sea of substandard titles before finding one that is worth your time and money. NetEnt, Barcrest, BigTime Gaming and NextGen all have their hands in play, although of course 888’s home grown titles from Section8 Studio are given the most leg room. Slots – Around 180 top quality titles make up the slot catalogue, with more than 50 of them exclusive to 888. Love from London and The Great War might be a couple you haven’t tried before. 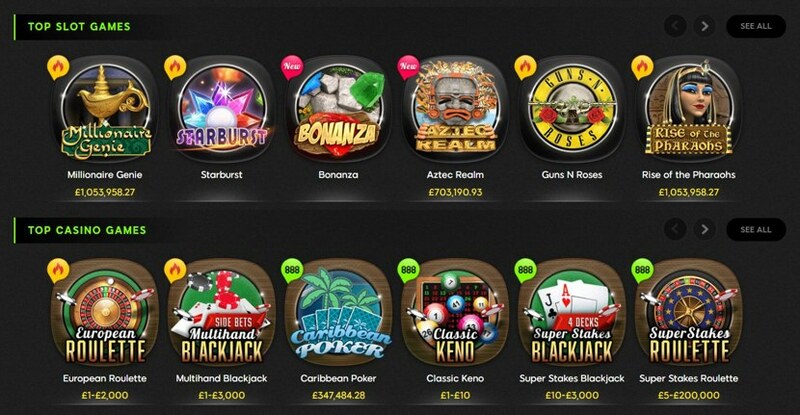 Jackpots – There are 30+ jackpots to get stuck in to, and all of them proprietary. This does mean smaller jackpots, but also less competition, and you can still bag over £1 million. Irish Riches and Pirates Millions are where to find the big bucks. Live Casino – Evolution Gaming adds 888 to their list of clients, providing Live Games such as Lightening Roulette and Dream Catcher. You can choose from 3 different camera angles, some games start from as little as 10p, and there is even a Pit Boss wandering around. Poker – Poker gets a special mention since 888 Poker is its own downloadable entity, giving access to tournaments and more or less every variant you can think of. Quick access and a pleasant layout makes this a good place to start for for the less experienced. Casino Games – A choice selection of Roulette, Blackjack, Baccarat and Poker games from Section 8 Studios. Poker makes up a good 50% of what’s on offer here, and we would especially recommend Oasis Poker, because maybeee…. Slot Races – Join a race from the Slot Races Lobby and compete with other players to win the most points. Prizes include Free Spins, Bonuses, FreePlay and Cash. Scratch Cards – There are only 11 of them but they are a fun way to spend some in-between time. See if you can strike gold with Alchemist, or maybe Merlin’s Millions will have that magic ingredient? All in all this is a fantastic product. The interface is interesting rather than confusing, and the conservative choice of tabs in the cleverly located side menu makes choosing your next move simpler, with further options available once you get there. We just wish those further options demonstrated a little more range. 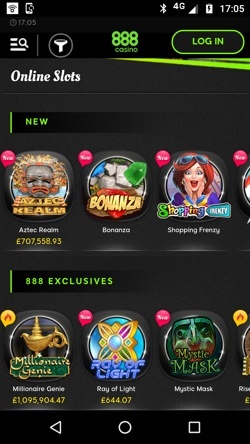 Players at 888 have a couple of options if they want to play on the move: there are various different apps depending on what kind of experience you are looking for, with the 888 Casino and 888 Poker apps being the most relevant here; as well as a virtually identical mobile optimised website that lacks none of the excellent features found on the desktop version. As always, the number of available games will be reduced slightly but in the main not much will change apart from the layout, although if anything, that looks even better on a mobile device. The interface and overall functionality and usability fare just as well as the main site, and although the app may take a few extra seconds to load up, once open it zips along nicely. There are also links to the other 888 offerings (Bingo, Poker etc) that will conveniently redirect you if you fancy a change of pace. 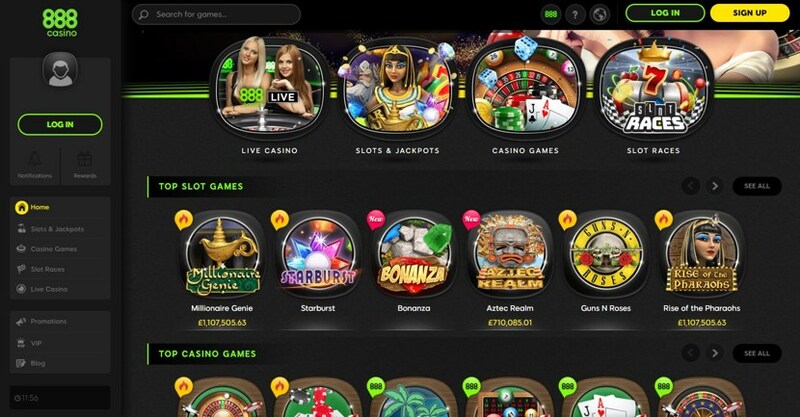 888 know they have a solid product in their online casino, and they haven’t been short sighted in ensuring that their mobile offering also makes the grade. Of course, it helps that it’s run on their own online platform, Dragonfish, which also offers B2B services. If other companies are buying it then you know it’s good. 888 have hit a home run in offering their customers seemingly every banking option in existence; including Paypal and ApplePay. Good news indeed. The only one of the usual suspects not on the list is Paysafecard, oddly. Processing times cast a shadow over proceedings somewhat, as you will have to wait a little longer for your money at 888 than you will at many other places, and maximums aren’t clearly stated. Time frames are listed in the table below in working days and, as ever, having your documents uploaded in advance will avoid further delays. We have listed the major contenders but if you like to use a more obscure method check the website (scroll to the bottom of the homepage and hit Deposits) – chances are they will accept your method of choice. 888 Casino is run by Cassava Enterprises (Gibraltar) Ltd, a subsidiary of 888 Holdings Plc, and actually started life as Casino-on-Net, the brain child of Aaron Shaked. Shaked established the company with his brother Avi and their business partners Ron and Shay Ben-Yitzhaq, also brothers. Casino-on-Net was rebranded as 888 Casino in 2010 to bring it in line with the other 888 brands. Having operated since 1997, you could say they practically invented the online casino, and being pioneers in the industry they have won their fair share of awards. Every year they seem to add to their trophy cabinet, but 2013 was arguably their most successful, winning both Operator of the Year and Best Casino Operator at the eGR Operator Awards. Things haven’t always gone smoothly for the company, though. Despite being universally popular they have incurred some of the largest fines on record, such as the £7.8 million the UK Gambling Commission demanded after 888 allowed 7,000 punters to keep gambling after they had tried to self-exclude; or the £120 million in profits they had to give back to the US Dep of Justice after the Unlawful Internet Gambling Enforcement Act of 2006. It says something for the power and reach of a company that can take such a financial hit and keep going, reputation almost unblemished. In fact, 888 Holdings remain one of the biggest names in online gambling full stop. So much so that it has been listed on the London Stock Exchange since 2005 and is a constituent of the FTSE 250 Index. When Gigi Levy, who was the Chief Exec until 2011, gets a $1million+ annual bonus, things must be going well. Drinks on Gigi. This is where 888 miss the mark completely, and it’s unforgivable if you ask us. They claim to be ‘Here for You’ with 24/7 customer support, but they make it so hard to find a contact option other than the e-mail submission form that you start to get the feeling they would really rather you didn’t. What they do offer, is an admittedly comprehensive, searchable FAQ. It’s divided into useful sub-categories and will usher you towards the contact form if you are struggling, but when other smaller companies offer so much more in this department shouldn’t 888 be able to match them? Make no mistake, this is a company with money in their pocket, and if they wanted to provide a genuinely helpful and reachable customer support service, they could. Our opinion? This failing is by design and not by accident. Live Chat – They tell us it’s an option, but can we find it? Can we heck. E-mail – Find Contact Us on the website and you will be taken to the e-mail submission form – the only support option that isn’t difficult to find. Or skip it and write to support@888casino.com but be prepared to wait a few days for a response. @888casino – The dedicated twitter support account has been deleted and this one hasn’t been used in months; so probably a dead end.